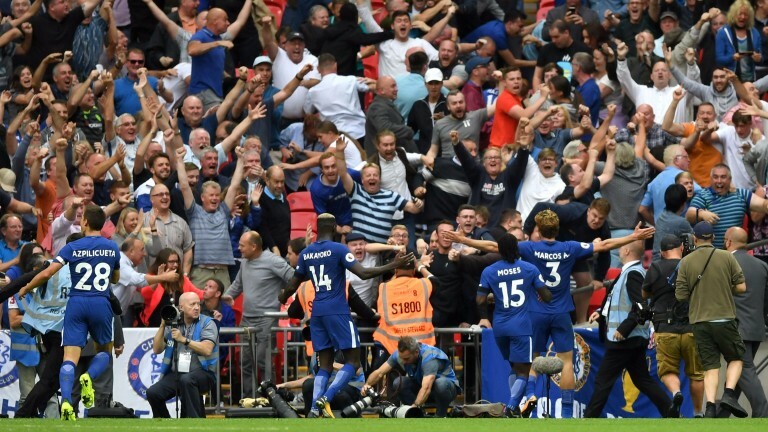 On January 4, Chelsea were 9-5 to beat Spurs at their White Hart Lane fortress yet yesterday they went off at 11-4 against the same opponents at Wembley. Perhaps the market was overreacting to the Blues’ shock defeat to Burnley, the absence of Gary Cahill and Cesc Fabregas, or stories of Antonio Conte’s disgruntlement at the club. Whatever the reason, the discrepancy between Chelsea’s odds in their two clashes with Spurs was noteworthy and a reminder to avoid kneejerk reactions in betting. Equally, Tottenham’s 2-1 defeat doesn’t mean they’re nailed on for a miserable time at Wembley. They conceded a late goal in a tight game of fine margins, having gone behind to a superb free-kick and seen Harry Kane denied an equaliser by the post. Brighton’s top-flight return has started with 2-0 defeats to Manchester City and Leicester but Seagulls fans shouldn’t despair just yet. They had 55 per cent of possession against the Foxes but struggled to make an impact in the final third and Chris Hughton will be eager to unleash Anthony Knockaert and Jose Izquierdo. Knockaert, last season’s Sky Bet Championship Player of the Year, has been restricted to brief substitute appearances as he recovers from an ankle injury while fellow winger Izquierdo could make his debut in the League Cup this week. The Colombian, Brighton’s record signing at £13.5m, scored 15 goals in 32 games for Club Brugge last season including one against Leicester in the Champions League. If the wingers hit the ground running in the Premier League then punters can expect Brighton to improve significantly going forward. Preston fans haven’t been treated to great entertainment this season but they won’t be complaining about a haul of seven points from their first four matches under Alex Neil in the Championship. North End have conceded only one goal, a penalty, after facing four of last season’s top nine – Sheffield Wednesday, Leeds, Derby and Reading. Their defensive record is impressive given that they conceded 15 goals in their last six games of 2016-17 and hosts Middlesbrough are unlikely to roll them over on Saturday. Carlisle eased to a 3-0 win over Cheltenham and things are looking bleak for the Robins in Sky Bet League Two. They lost at ante-post relegation favourites Morecambe on the opening day before a tense 1-0 victory over Crawley, another side likely to struggle this season. Cheltenham were grateful for a fine performance from on-loan keeper Jon Flatt in that game – Crawley had six shots on target to their hosts’ five – but they were 2-0 down after 18 minutes at Carlisle and relegation quotes of 11-2 are well worth considering. Treble-winning Celtic went through the entire domestic season unbeaten in 2016-17 and their rivals can expect little respite this term. With a Champions League trip to Kazakhstan on Tuesday, Brendan Rodgers shuffled his pack for Saturday’s Ladbrokes Premiership game at Kilmarnock but the Bhoys still eased to a 2-0 win. Kieran Tierney, who turned 20 in June, was the oldest member of the back four at Rugby Park and that depth of talent should enable Rodgers to have another good crack at the domestic cup competitions and the Champions League group stage.